In the same way that Puget Sound physical processes are linked to ocean, freshwater, and terrestrial environments, the Puget Sound food webs described above do not exist in isolation and are connected by organisms that reside or migrate outside of Puget Sound marine waters.Changes to the abundance and relationships of species within Puget Sound may be affected by changes in the open ocean or terrestrial landscape. For example, many waterbird species, including loons, grebes, scoters, murres, and murrelets, move to the protected waters of Puget Sound for the winter and feed on Puget Sound species, thus are transient members of the food web. Recent studies in Puget Sound and surrounding waters have shown 50–95% declines in populations of many marine bird species during the past 20 years (Nysewander et al. 2001, Bower 2004). The species that have shown the most alarming declines (80– 95%) are diving birds such as common and red-throated loons; western, red-necked and horned grebes; and marbled murrelets, all of which specialize on schooling pelagic fish (Nysewander et al. 2001, Bower 2004). Marked declines have also been observed in summer breeding populations of fish-eating seabirds. 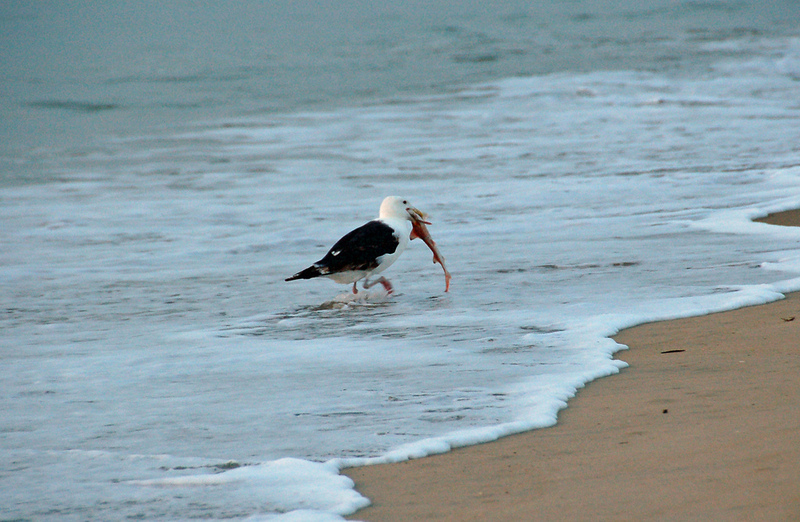 Moderate but still serious declines (50–60%) have also been observed in a variety of birds that are less dependent on pelagic forage fish because they can also subsist on benthic or demersal fishes (e.g., cormorants and guillemots) and subtidal or intertidal invertebrates (e.g., gulls and scoters). Declines in these waterbirds may reflect declines in species that are harder to count, such as small benthic or pelagic fishes. Forage fish species may be affected by changes in habitat and physical processes both within and outside of Puget Sound, with ramifications to food webs across broad areas. The movements of transient and migratory species also connect Puget Sound with the rest of the North Pacific. Some marine mammals such as sea lions and orcas spend just a portion of the year in the waters of Puget Sound, migrating to other areas at other times of the year. Salmon are an outstanding example of complex food-web linkages as they rear in freshwater and estuarine environments, migrate to marine waters and the open ocean, and return to transfer nutrients to terrestrial species such as eagles and bears. Additionally, salmon can simultaneously occupy multiple places in the food web depending on their life stage, size, habitats, and time of year.